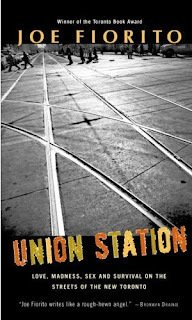 In Chapter 1 of Union Station, Joe Fiorito examines the downtrodden who immigrated to Canada with such great hopes of success. Fiorito investigates the ESL classes of one private enterprise who people pay to teach them English. What Fiorito finds is that recent immigrants with Phd's and other university and college degrees end up doing jobs like taxi driving and mopping floors. Besides obviously the Canadian public and private sectors not recognizing the immigrant's degrees from foreign universities and colleges, the main problem in Toronto is the lack of English. The problem of lack of English is shown when Fiorito writes: "because they speak slowly, or because they hesitate, clerks in stores and drivers on streetcars sometimes ignore them." (Fiorito 7). Question: If the immigrants cannot speak basic English in order to do shopping or take transit, how are these immigrants going to be civil Engineers and doctors? That is perhaps the biggest problem the immigrants need to overcome. It is not that these immigrants aren't willing to learn. Chapter 1 of Union Station proves they are in terms of at least acquiring the English language. It just seems that immigrants are held back from getting ahead in some ways. Sure there are job banks at both the federal government and at private institutions like the Dufferin Mall in Toronto (Fiorito 11). So what is the holding these immigrants back from getting the jobs they expected to hold once they landed in Canada? Fiorito doesn't answer it, at least not in this chapter. It does have me wondering though if the federal government, the level of government responsible for immigration constitutionally in Canada, has taken a recent look at the 'after' of immigration. "After?" After immigration occurs the immigrant needs to find shelter, food and a job as basics in order to live in Canadian society. The question I have for the federal government is: "How can Canadians make it easier for immigrants to acquire each of these once they have been accepted as an immigrant and landed in Canada?" The problem with your question is who you are asking because once immigrants are accepted into the country it is the provincial government who is responsible for helping them. Perhaps I should have left "government" as a generic term. Perhaps all three levels of government need to look at the issue I raise on immigration and how to best deal with it.